+ Access to the track & trace of the Renties Ypres Rally via the unique barcode. 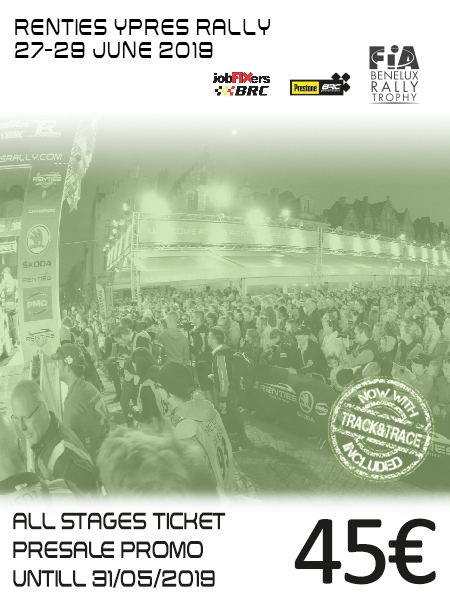 This is a pdf e-ticket that has to be exchanged in the rally shop Grote Markt Ypres between 22 and 29 June for an all stages wristband ticket. As soon as it is printed on white paper, the only valid ticket is to swap against an all-stage wristband ticket. All elements on the pdf ticket must be clearly legible. In case of doubt, the swap against an all stages wristband ticket can be refused. Each barcode is 1 all stages wristband ticket. The print will be read in the rally Shop Grote Markt Ypres between 22 and 29 June 2019. The ticket can only be read once in the rally shop when it is full. All abuse, counterfeiting or fraud can be prosecuted. In no case accept so-called outdoor kiosks that are offered to you by third parties or sellers other than the offcial. This ticket can not be refunded. The opening hours of the shop 2019 for the exchange of one e-ticket for one wristband ticket.